Did you know? The United States of America didn’t start minting its own coinage “nationally” until 1793 (technically 1792 with the half disme/dime). Prior to that, circulated currency was mostly from Britain (which makes sense, of course, since we were British colonies), Spain/Mexico, and France. In the 1700s, copper halfpence (half pennies) donned the bust of England’s King (depending on the years in the 1700s it was either King George I, King George II, or King George III). If you knew that, did you know that half or more of the King George halfpence in circulation were counterfeit? 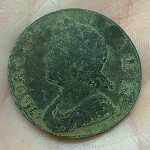 During my searching of New Jersey soils, I’ve been lucky enough to find both authentic and counterfeit King George II half pennies, as well as an 1806 or 1807 King George III. The KGIII was a spectacular find in my opinion as it was completely unexpected! I was helping someone who’s home was built in 2009 determine if there was an oil tank on their property. While that search came up empty (much to their delight) I continued to investigate the land for smaller artifacts. After a bunch of big pieces of aluminum siding, I was shocked to see a big copper coin lying in the plug I had dug. And in my hometown no less! Prior to “national” coinage, some colonies minted their own coins. 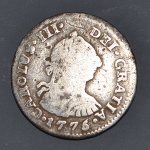 In the world of relic hunting, we call them “state coppers.” Of the many of the colonies that minted their own coinage and tokens, New Jersey was one of them. 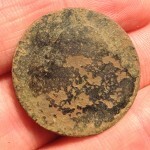 While I’ve been fortunate enough to find a few Connecticut copper coins, I’ve never found the one coin I seek the most – the New Jersey copper. The Coin and Currency Collections in the Department of Special Collections University of Notre Dame Libraries website provides a great history, and interesting story about the men who were granted rights to mint NJ coppers, the lawsuits and jail time they endured, and the method used of pressing the design into the copper blank. I highly recommend you read the full story. I hope some day to have my own story of the NJ Copper to share with you. If and when that day comes, I hope the coin is in decent enough shape for me to identify it. 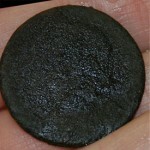 NJ soils and the fertilizers used on them can be tough on copper coins. 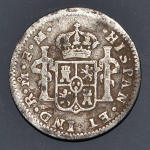 I have a few coins that, in spite of my best restoration efforts, I simply can’t and will never be able to identify. Maybe one is indeed a NJ copper, but until I can say that with certainty, my search will continue. And truth be told, when that day comes, one won’t be enough!